Riley and the rest of our team were out at Shot Show 2019 a few weeks ago, and our coverage continues. Riley had the chance to talk with Rod from Kimber about their latest addition to their line of pistols, and they're excited about this year, for good reason. 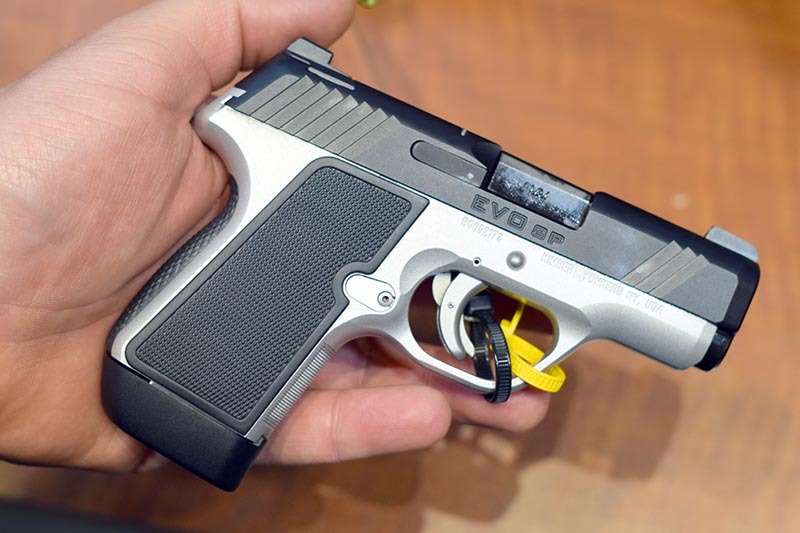 The Kimber EVO SP 9mm is a sub-compact striker fired pistol. Known for their 1911 pistols, this isn't the first time Kimber has released a pistol in the striker fired format. The first one, the Kimber Solo, was a bit of a flop–to say the least. The EVO, seems to be the evolution of that pistol. “We wanted to make sure we were going after that most reliable most shootable sub compact EDC gun. We wanted to reach the crowd that wanted that striker fire, (and) integrated trigger safety,” Rod said. The EVO comes stock with tritium night sights and has a magazine capacity of 7+1. The pistol's magazine release can be moved to accommodate South Paw shooters. Other features include a 6.5 lb. trigger, G10 grips, loaded striker indicator and a 16-17 lb. slide racking force to make it easier for smaller shooters. The Kimber Evo trigger felt great. It was smooth without any stacking. Even better, the muzzle flip was minimal on this aluminium framed micro compact pistol, which was surprising. The good trigger combined with good sights and minimal flip helped me ring the steel plates at what I'd call 20 or so feet consistently. According to Rod, retail cost for the Kimber EVO SP 9mm should land around $850-$999. Let us know what you think about this new Kimber pistol in the comments below. Love Kimber, have a half-dozen of them, all .45 except 1 Micro 9. Glad they came up with a Stryker-fired DAO, but take a serious look at the Sig 365. Best shooter I’ve got and it’s 12+1 capacity and sweet trigger make it my new EDC. Of course, Kimber is still my fave and they’re just a little behind in this genre. When the price comes down I’ll have to have one. I agree Jim. As a Kimber owner and lover myself, I think it’s a hard sell in the super saturated sub compact striker fired market. The price quite high, and as you pointed out, capacity is on the low side. I own a Shield 9, and I have a hard time justifying the price of this pistol. It looks great, especially the evo sp, but my Shield has never let me down, and it looks quite similar to the new Mossberg pistol… They are going to have to drop the price considerably for this to sell. I agree with you on the price. I also agree that it’s bad timing with the release of a much cheaper pistol that performs very well. I shot both, and preferred the Mossberg. I think there is still room in this market, though, and companies have to start thinking outside the box to stay profitable. The market is rough right now.